One of the cardinal rules of good potato au gratin is it cannot be dry. The cheesy cream sauce needs to ooze out. Not “run” out all over the plate in a big wet mess, but just slowly oooooze out. 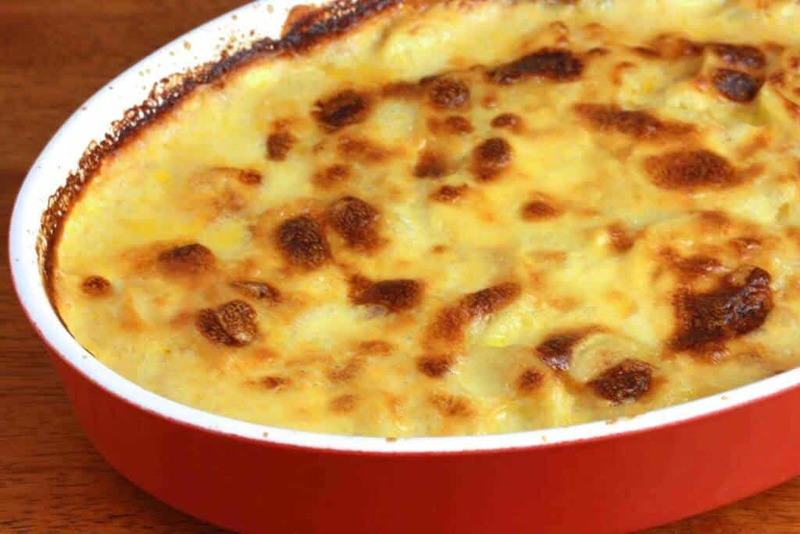 Here is the classic Creamy Potatoes Au Gratin at its best. I don’t think I’ve ever met a person who doesn’t like potatoes. I’ve met plenty of picky eaters, but even the pickiest will eat potatoes in one form or the other. However they’re prepared, they’re the perfect comfort food. And combined with cream and cheese they’re simply heavenly. 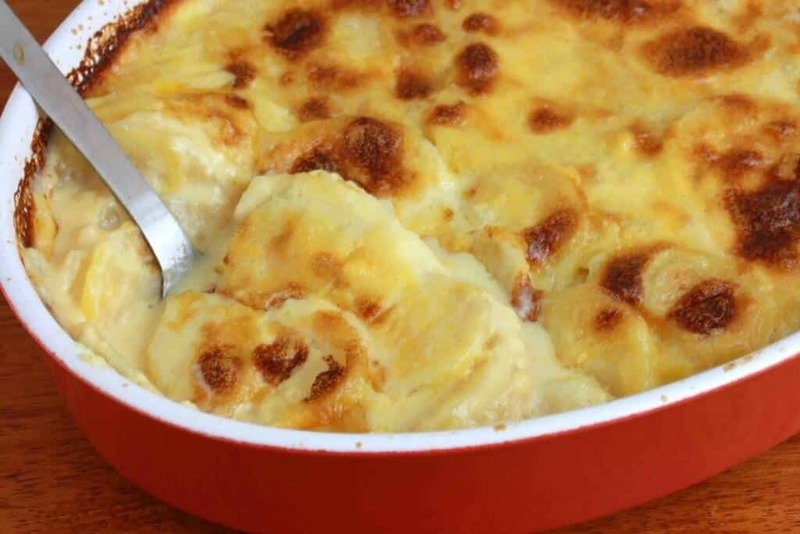 Au Gratin potatoes, or potatoes au gratin – however you wish to call them – make such a wonderful, versatile side dish that can be served with just about anything. And of course it’s practically a staple at the holiday dinner table. 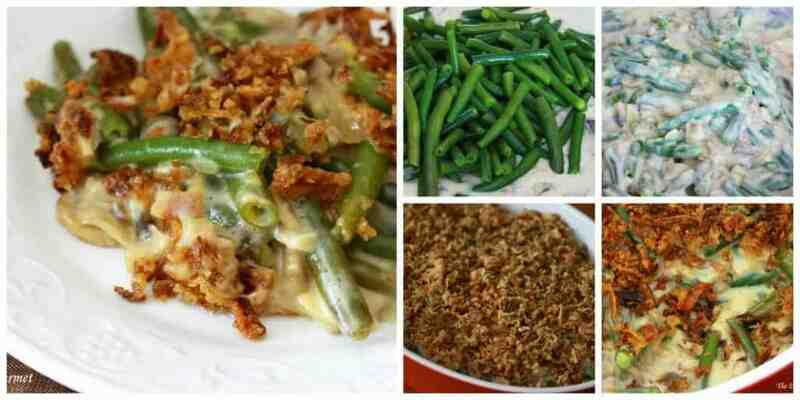 And speaking of casserole side dish staples, don’t forget to try my Ultimate Green Bean Casserole made from scratch. A perfectly creamy sauce with bacon, mushrooms, white cheddar and more. It’s out of this world! Now you have two of the most classic side dish casseroles at their best to make your holidays – or any occasion – shine. Dice the onions, mince the garlic, and thinly slice the potatoes. 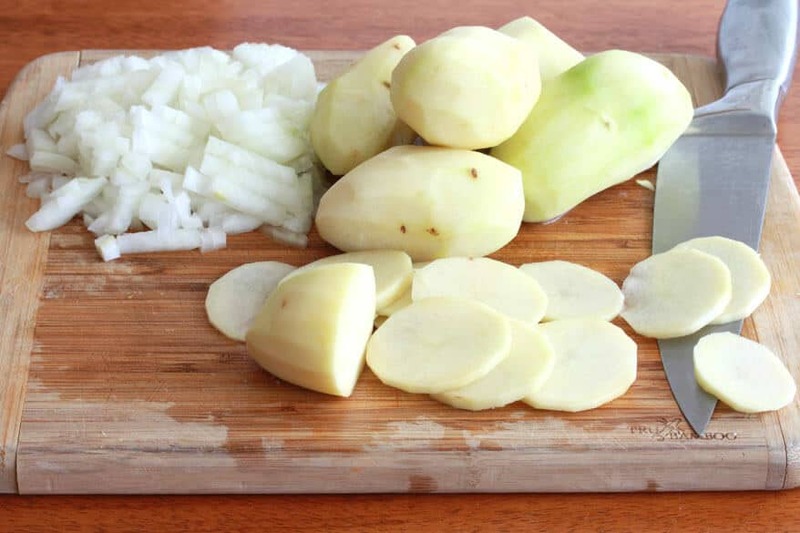 You can slice the potatoes by hand or you can use a kitchen mandolin to do the slicing. It makes the job faster and easier and ensures they’re sliced the same width. THIS ONE is the same one I bought in Germany and took back to the States with me – I love it. It’s also Cook’s Illustrated’s “Top Choice”. THIS ONE is currently less than half the cost and will also do the job just fine as well. 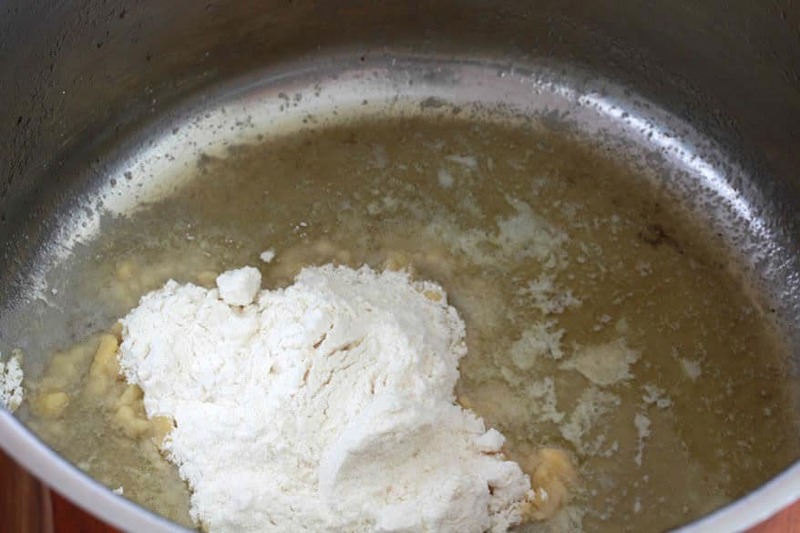 Heat the butter in a stock pot over medium-high heat, add the flour and whisk until smooth. Continue simmering and continually whisking the mixture for two minutes. 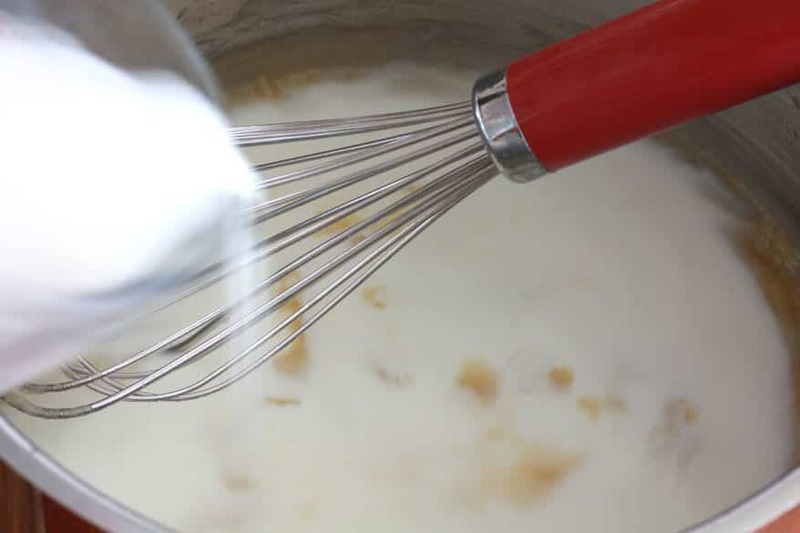 Add the milk, cream and salt and whisk until the mixture is smooth. 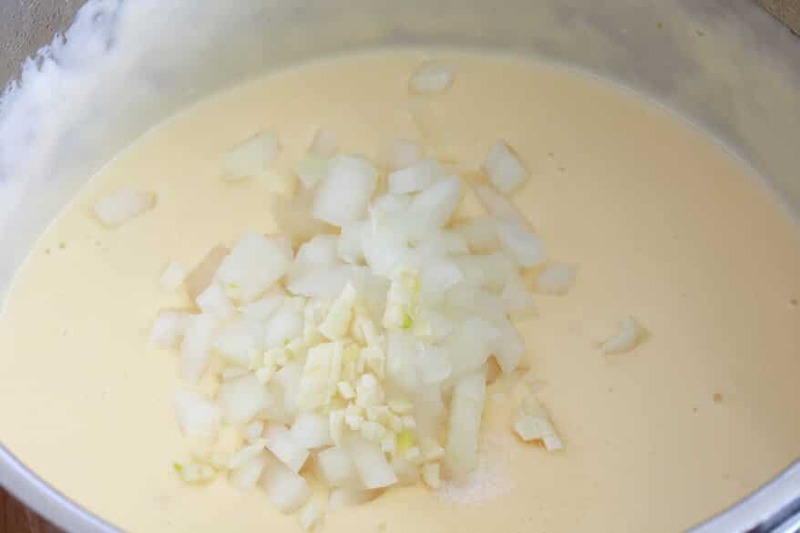 Bring to a low simmer and continue whisking until the sauce is thickened. 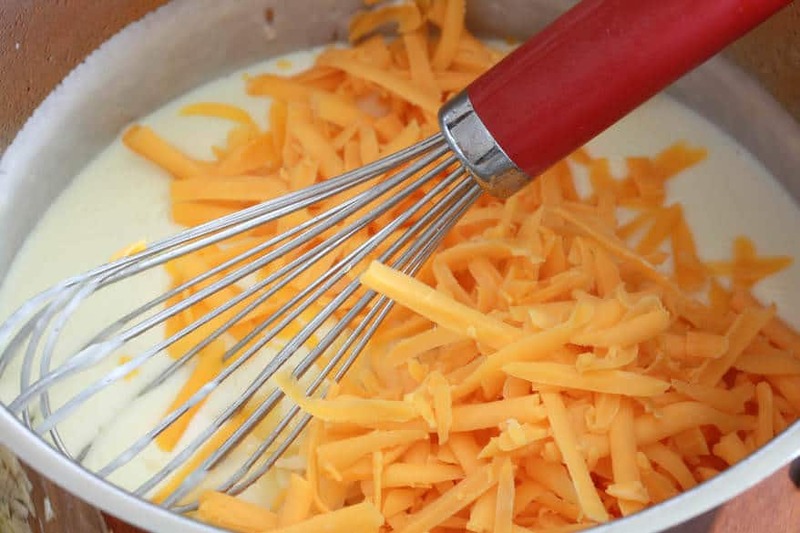 Whisk in the cheese until it’s melted. Pour the mixture into a 2 quart casserole dish. Cover with aluminum foil and bake in an oven preheated to 350 degrees F for about 1 hour or until the potatoes are tender (time can vary depending on thickly the potatoes are sliced). Uncover and bake for another 20 minutes or until the top is lightly browned. Let sit for about 5 minutes before serving. 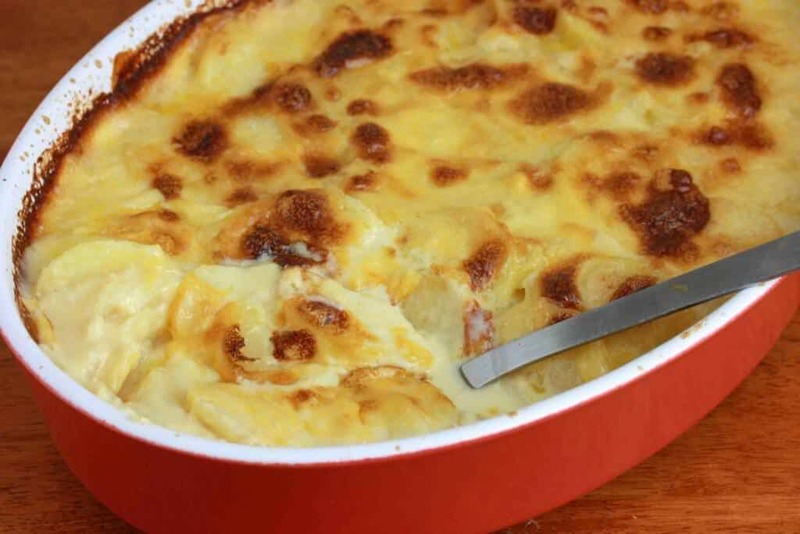 Dish up those deliciously cheesy, creamy oooooozing au gratin potatoes and enjoy! HAVE YOU TRIED THIS RECIPE? PLEASE LEAVE A STAR RATING IN THE COMMENTS BELOW! Au gratin potatoes at their very best! Melt the butter in a stock pot over medium-high heat. Add the flour and whisk until smooth. Simmer, whisking constantly, for 2 minutes. Add the onions and garlic and stir to combine. Add the milk, cream and salt and whisk until smooth. Bring to a simmer and whisk until thickened. Whisk in the Cheddar and half of the Parmesan cheese. Whisk until melted. Stir in the potatoes. Pour the potato mixture into a 2 quart casserole dish. Sprinkle with remaining Parmesan cheese. Cover with foil and bake for 1 hour or until the potatoes are soft. 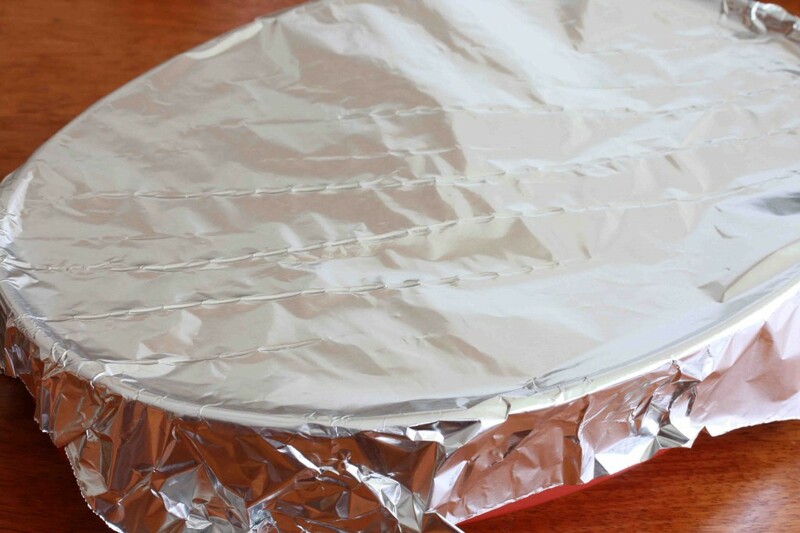 Remove foil and bake for another 20 minutes or until the top is lightly browned. Let sit for 5 minutes before serving. Question: "Can I make this ahead of time?" Answer: I've heard mixed reviews. It's generally recommended not to because the potatoes can become discolored. You'll definitely want to make sure the potatoes are completely submerged under the sauce otherwise they'll discolor. If you're going to make it ahead, most people recommend to parbake it...assemble the au gratin and bake it half to three-quarters of the way and then bake it to completion the following day. My recipe is nearly the same as this and I make it way too often. I just love it and then I can’t stop eating it until it’s gone. Lovely dish. Potatoes au gratin recipe sounds great. Can it be made ahead? Hi Sue, it’s generally recommended not to because the potatoes can become discolored. I’ve heard of people making it the morning of without any problems though, but wouldn’t recommend doing it as early as the night before. Unless you parbake it…assemble the au gratin and bake it half to three-quarters of the way and then bake it to completion the following day. 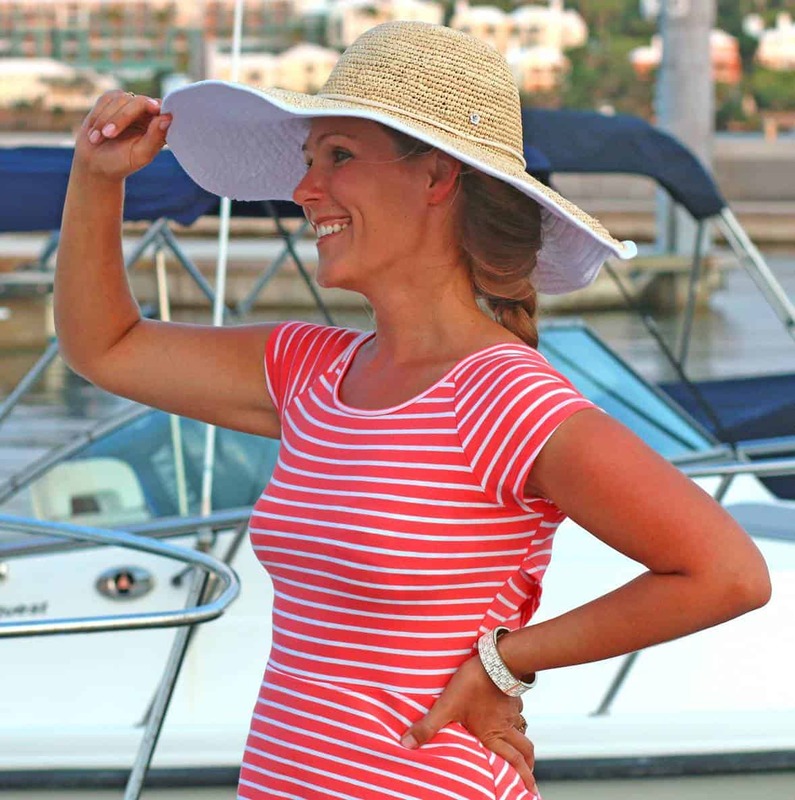 Hi Kimberly: Thought I would share my experience with this. I decided to try this dish for a work pot luck. It was already baking in the oven the night before when I read the comments regarding whether it would work for a make ahead recipe. As the comments have been that the exposed potatoes can discolour, in the last 15 mins when the foil was off for browning the top I sprinkled some shredded cheddar and mozzarella cheese to cover the potatoes. The colour combination was great and the extra melted cheese was delicious. The following day of the pot luck I simply reheated them thoroughly in the microwave so they were hot and bubbly all the way through. I don’t know if they were any different from same day as I hadn’t made them before any other other way but they were a huge hit. I overheard comments around the table… These potatoes are to die for, was one. One request for the recipe was that my colleague’s daughter doesn’t like potatoes but she would love these. Thank you so much! I would not hesitate to make these ahead this way in the future. Beautiful recipe! I am so happy to hear that, Kelly, thanks so much for the helpful feedback! I will tell you one thing I love this recipe and I an going to fix your pork chops now. I will let you know how that comes out. Delish! That’s awesome, Cheryl, thank you! Happy cooking and looking forward to hear how it went! This looks like a great recipe, but has anyone found it a little salty, I always think cheese has so much salt in it already. I haven’t tried it yet, so I am just asking for your opinion. So happy to find this website, can’t wait to try some of these recipes. May I bake this dish a day ahead of time and reheat day of party??? Hi Lynne, my guess is that baking it in advance and reheating it will cause the potatoes to absorb more of the liquid so it may be a little on the dry side. I’d probably recommend instead assembling it a day ahead and then baking it the day of the party. Perfect. Doing the prep work and assembling IS all the work anyway….it’s no bother to simply put in the oven the next day! hopefully as long as potatoes are covered with liquid they won’t turn color. Exactly, keeping those potatoes covered will hopefully prevent that. Let us know how it turns out with the day-ahead assembly! 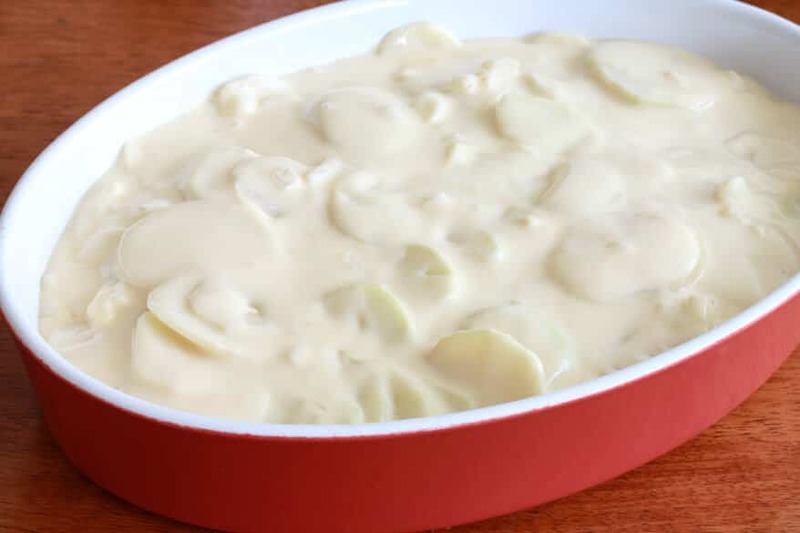 Thanks for sharing your recipe on how to make creamy au gratin potatoes. I’ll definitely will look into your tips when making this dish next time. I made this and sprinkled cayenne pepper on it before baking. My husband likes his food hot and this dished his day. Hi Sharon, that sounds like a good solution for your heat-loving husband. Glad it was a hit! I’m so happy to hear that, Susan, thank you!! Looks just like what I’m looking for. You call for cheddar. Doesn’t it get oily or grainy? That has been my experience so I use Colby. The Parmesan is a must! Hi Deborah! No, I’ve never had it turn out oily or grainy but you can certainly use any cheese of your choice here. Happy cooking! Wonderful, I’m so glad to hear that, thank you! Yes, as you can see I’ve made it both ways myself and both turn out great. Cooking the onions and garlic may give it a slight edge but one that probably most people wouldn’t even notice. So I usually just opt for the quicker route. I can’t wait to make this for Thanksgiving! I just went out and got ingredients for this receipt. Looking forward to making this for my family tomorrow!! Thanks in advance! Wonderful, Nikisha, happy cooking and please let us know what you think! I needed an Au Gratin potato recipe for Thanksgiving this week, and did a trial run with this one today. IT WAS AWESOME!!! Thank you so much!!! Fantastic, Karen, thanks so much! What kind of potatoes do you use? Russet? Yukon? Thanks! Hi Kim, you can use either (I have) and it just comes down to personal preference. Yukons hold their shape a bit better and aren’t mealy, but many also like the flavor of Russets and because they’re mealy they’ll absorb a little more of the liquid. I’ve also known people who use a combination of the two. Really, you can’t go wrong with either. I have made this several times and it is so delicious, we love it! sometimes I add diced ham to serve it as a main dish, always a hit! I was wondering if anyone might know the nutrition info for this recipe? Thanks, Cindy, and the addition of ham sounds perfect! For nutrition info there are a number of sites (caloriecount.com and fitday.com are two) where you can enter in the ingredients and quantities and it calculates the complete nutritional profile for you in a couple of seconds. One more question! Can this be made a day ahead? Or even two days? Hi Kim, I haven’t tried it but most people say that au gratin potatoes reheat nicely. The only thing is that it will have absorbed most of the liquid so when you prepare the dish I would make the liquid a bit thinner than normal. I’m going to make this for our family Christmas dinner this weekend but need to prepare a day in advance. I’m thinking another 1/2 cup of cream or milk (tending toward cream because yum cream, to account for the extra absorption) do you think this is reasonable or should I use even more to thin? I’m going to have to bake, then travel, then reheat. Any suggestions/thoughts on if the extra liquid should be milk or cream? Thanks in advance for what looks like a fantastic recipe. Hi Scott, that sounds like a good plan and you can use whichever you prefer. Happy cooking and let us know the result of the advanced preparation and reheating! Hi Kimberly, just an update for you. As you know I had to assemble a day ahead, then the following day bake, travel then reheat. Using red potatoes, it would have been perfect without the extra 1/2 cup of cream. They traveled and reheated without incident. I was worried the sauce might break from reheating but it didn’t. The sauce was just a touch to thin but that didn’t matter they were still delicious. For others who might be in the same position I was in, I recommend just following the directions as they are. Thank you for all the work you put into your blog. Thank you so much for that update, I really appreciate that! This will be very helpful info to anyone else wanting to make this in advance. Thanks again! When doubling potatoes, what should ratio of other ingredients be? Hi Ruth, I would double everything. Happy cooking! I am making BOTH this au gratin potato recipe AND the Ultimate Green Bean casserole recipe on your site for Christmas. QUESTIONS (forgive me…I’m a novice): I’ll be doubling both recipes. 1> Should I use a double-sized casserole dish called for in each recipe or spread the ingredients across two casserole dishes? If one larger dish, does that change the cook times at all? 2> I would like to overlap the baking of the two dishes (i.e. put in the green bean dish while the au gratin is also baking and remove it in time to allow it to stand for the 30 minutes suggested). Will this affect cooking times at all to have it in the oven simultaneously? Hi Philip, if the casserole dish is double-sized in depth but not any bigger in diameter, then it may require a little longer baking time but you’ll just need to test it for doneness at the end of the cooking time and determine if it needs to to bake a little longer. For question #2, that really depends on your oven more than anything. Some ovens are very efficient in evenly cooking things on two different racks, others are not. Happy cooking and Merry Christmas! Much thanks Kimberly – I’ll give it a whirl and will reply after Christmas to say how it went over with the family! Hi, kind of a cooking novice myself so I read recipes to a t. I need a potatoe side for Christmas but there will be about 15 to 17 people. If triple recipe and use 3 different dishes, do you think I can bake all at the same time? Thanks in advance. I don’t really want to have to resort to crock pot. I want that crunchy top layer. Hi Jacqueline, it really depends on your particular oven. Some ovens are efficient at being able to evenly heat foods on different racks at the same time, others aren’t. An alternative is to cook each separately in advance and then reheat them. Can I use cornstarch or GF FLOUR to make GF? Hi Michele, some GF flours gum up when attempted to use as thickeners so I’d use cornstarch. The general guideline for cornstarch is 1 tablespoon of cornstarch dissolved in 1 tablespoon of water per 1 cup of liquid. So that would mean about 2 1/2 tablespoons of cornstarch dissolved in 2 1/2 tablespoons of water and then stirred into the milk as soon as it’s added. Hi Carol, I haven’t tried it before but perhaps some of our readers can offer input. Kimberly the person who posted comment on prep & refrigerate potatoes au gratin, the day before, did the potatoes get discolored after baking? Would someone please help? I need to prep tomorrow for a New Year brunch.Thanks & Happy New year. Hi Patricia, we’ll see if they can offer some input but I would think that as long as the potatoes are submerged in the liquid they won’t discolor because it’s exposure to air that does that. Happy New Year! Thanks for the prompt reply Kimberly. I just found your recipe today. It’s in the oven now. I made just a few adjustments, used half cream and half milk, used a little more parmesan, and added red chile flakes. I have to say, the sauce was absolutely delicious. I could eat that by itself. With the sauce so good, there is just no way the potatoes can be anything but that. Thank you so much for this recipe. Just wondering what the ingredient ratio would be for a 3qt casserole dish? Kimberly, is the addition of heavy cream a must? We like to stay away from it in our cooking. Can you recommend a substitution for it? Hi David, you can use all milk instead. Milk doesn’t thicken the same way that heavy cream does, so you may just need to add a tad bit more flour and you’ll be all set. David, you might try substituting skim evaporated milk for the cream or even all the milk. It always bakes well (no curdling) and might still provide the creaminess you are looking for without the milk fat. I haven’t tried it in this recipe but I do substitute with evaporated milk often when something calls for cream and I don’t want to make a run to the store. BTW, we love this recipe, Kimberly! If I double this recipe and use a 2 1/2qt. dish, how long should I cook it for. Or is this not a good idea? Hi Beth, doubling it is perfectly fine and as long as it all fits in a 2 1/2 qt dish that should be fine as well, though you want to avoid the potatoes being too close to the top or the liquid may bubble over. If you have a larger baking dish I’d go with that. You may need to cook it a little longer but check after an hour to see if the potatoes are done to determine if they need some more time. I was wondering if it’s ok to use regular baking potatoes,or do they lose their shape? Hi Sherri, regular potatoes (e.g., russets) will not hold their shape as well and tend to get mushy. Firmer, waxy potatoes like Yukon Gold’s are definitely preferable. Thanks for such a fast response on my baking potato question! I meant to ask about regular white potatoes,but I’m sure they won’t work either. ( I already had 10 lbs for Easter dinner) yes, I have to make 10 lbs..Wish me luck! Hi Peggy, yes, you can add some dry mustard if you like – I’d probably go with 1/2 teaspoon. 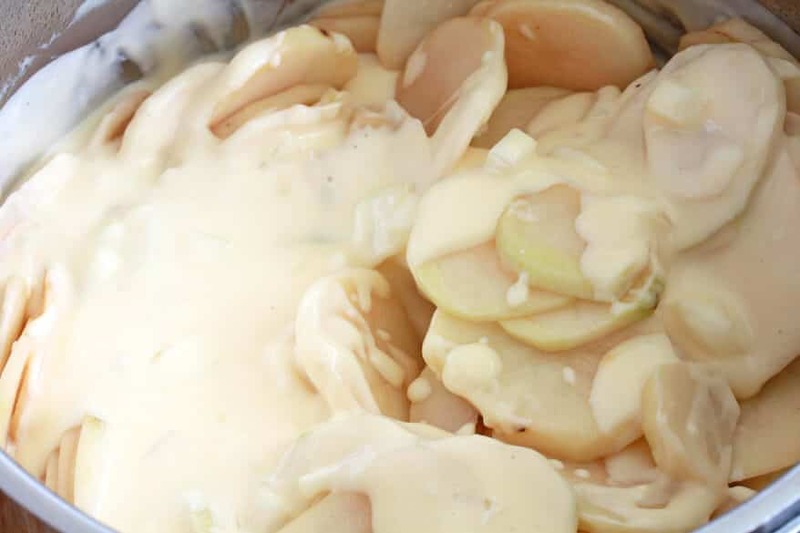 I made your potatoes for Easter – They were so amazing – Just wondering with the warm weather approaching any thoughts or suggestions on possibly microwaving this dish. Thanks, Lisa! Theoretically that’s possible but I haven’t tried it so I can’t recommend a time length. You would just need to test the potatoes with a fork every few minutes to determine doneness. This recipe was perfect! I made it for my husband’s birthday dinner when he requested potatoes au gratin. He was expecting the boxed kind but I surprised him with this instead! I didn’t have to add any seasoning or change it at all. It was a big hit! The potatoes cooked completely and the sauce was delicious. Thank you! Wonderful, I’m so glad it was a hit, thank you! need to make gluten free …corn starch is recommended …does it get blended in with butter to form the roux before adding liquid? Hi Rita, the cornstarch would be dissolved in water and then stirred into the milk. The general guideline for cornstarch is 1 tablespoon of cornstarch dissolved in 1 tablespoon of water per 1 cup of liquid. So that would mean about 2 1/2 tablespoons of cornstarch dissolved in 2 1/2 tablespoons of water and then stirred into the milk as soon as it’s added. Can you use half and half instead of the heavy cream or milk ? Hi Shandelle, yes you can. Thank you ! Would I just replace the heavy milk with the same amount ? I made this recipe today. Everytime i make a cheese sauce and add flour, the potatoes never get cooked enough. So i followed the directions and ended up cooking 20 mins longer and i thought they were still hard. The true test is cutting through them with a fork and this recipe just didnt cut it for me. I thought the amount of salt was perfect, but the potatoes were hard. Its like no matter what i do, au gratin potatoes never come out the way i want them which is fork tender and flavorful. Adding cheese and garlic just doesnt give me the right flavor im looking for. Its never creamy. Its always pieces of cheese that look curdled. Ive been cooking for a while and have yet to find a recipe for au gratin that i like. Kimberly could I substitute onion powder for the onion? My family does not like onions:/ First timer here :) Will be doubling recipe today for a party of 14! Hi Becky, yes, feel free to omit them and give it a bit of an onion flavor boost with onion powder – I’d use just under a teaspoon. Kim using this recipe for work can I cook it in the oven and carry it to work in a crock pot to keep it hot. Hi Loretta, yes, you sure can! To make this recipe ahead of time using Yukon’s, would it work to parboil the potatoes so they don’t turn black? then put the recipe together, refrigerate, then bake the next day? I don’t have time to make everything the day of the event. That’s a good question, Sharon, let’s see if any of our readers have tried that and can comment. You can also bake it completely the day before and simply reheat it the day of, though the potatoes will have absorbed more of the liquid that way. Would it work if I cooked them the day prior to the event and then heated them in a crock pot the next day? How long would that take? Maybe they would be too much like mashed potatoes by heating them in the crock pot. That would work, Sharon. And in that case I would use Yukon Gold potatoes because they’re firmer and hold their shape better. I am sorry for asking so many questions! If the flour is exchanged for cornstarch in these potatoes will it change the taste or texture? I have some gluten free people in my family. Was thinking it would not be that much flour for gluten free people but now I am having second thoughts. Thank you for your answer. Hi Sharon, no problem! Yes, you can substitute cornstarch but without testing it I’m not sure how much you’d need. You’d just dissolve it in a little water first and then add it, bring it to a simmer until thickened, etc. THE BEST au gratin potatoes!! I’ve tried several recipes and this is my favorite and the one I’ve been making for the past 3 years. It’s taken me that long to finally tell you, but thank you, Kimberly! Thoroughly delicious! The perfect amount of sauce and the flavor is fabulous! If I need to make a larger batch of this (say using 4 or 5lbs of potatoes) can I simply double the other ingredients? Would the cooking time change? I am still a kitchen novice but your blog is helping me a great deal. Hi Genevieve, yes, simply double everything. The cooking time will depend on the casserole dish you’re using. If you’re using a larger casserole dish with a larger surface area then the cooking time will be about the same. If the casserole dish is deeper then you may have to bake the potatoes a bit longer. I’d bake it for the time noted and then stick a fork in the potatoes to check for doneness. I will be making this recipe for about 25 people for Christmas dinner. How would I prepare that? Should I just double the recipe for 1 batch, then double for another batch. I figure I may have to use 2 separate casserole dishes…I’m really not sure what to do. Can you help please…I’m stressing out! This will be my first time hosting Christmas dinner and I want it to go well. Hi Rose, yes, that’s probably what I would do, make two double batches in two large casserole dishes. They may need a bit longer to bake so check them after the prescribed time (stick a fork in the potatoes to check for doneness) to determine if they need to bake a bit longer. I’ve been making your recipe the past 3 years and it’s always a hit, thank you! I wanted to use your recipe because it sounds and looks super creamy. I was wondering instead of putting in the oven i could put in a crock pot and if so would you know for about how long i would need to cook it. Great dish. I substitute BaliShannon sharp white cheddar cheese fro ireland. You can get it at same. Fantastic addition to the already great dish. It has become our Christmas Eve Tradition. Thanks, James, and white cheddar is a great choice! Too salty, too soupy, I wasted hours on this recipe. This is our third year making this, always a smash hit, thank you! It’s in the oven now! I made this for Thanksgiving and everyone loved it so we’re having it again today for Christmas dinner! Merry Christmas! These truly were perfect, thank you! I made these yesterday for Christmas dinner and they were excellent, thank you! Made this for Christmas yesterday – excellent recipe! 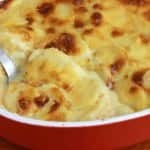 These are the best au gratin potatoes I’ve tried! Followed your recipe exactly and it turned out perfectly with compliments from the guests! Wonderful, James, I’m so glad to hear it, thank you! Made these potatoes tonight and they were creamy and delicious! Everyone loved them! I used Yukon gold potatoes and made a few slight adjustments . Used a little less onion and added a few shakes of black pepper in the cheese sauce . I didn’t have whole milk so used 1 c. Heavy cream and 1 1/2 c. 2% milk. I sliced the potatoes as thin as I could but still needed an additional 10 minutes covered baking time . Came out perfect ! Will definitely be making these again soon. Fantastic, Cindy, thanks so much for the feedback! Delish! I used all half-and-half, a little more onion, used mozzarella and cheddar, and a bit of ground mustard. Fantastic, Kay, thanks so much for the feedback! This recipe was the easiest & best potato-gratin I’ve ever made!! I assembled in the morning and cooked at dinnertime. Will be my go-to for scalloped potatoes and part of every Easter dinner from now on! Thank you Kimberly! Hi Kimberly, I made this for Easter dinner with a spiral ham. I did not put onions in as we do not like them but used your suggestion to use slightly less than a teaspoon of onion powder and it worked great. Also, I always have trouble getting the potatoes cooked in all potato casseroles, so I slice the potatoes and cook them half way in water before putting the casserole together. It seems to work better for me. The potatoes are done after an hour. Loved this recipe. Thank you for the post. PS Did you fix the glitch with the stars, or was I able to give the 5 star rating because I had already signed up for the newsletter? Thank you for this recipe! Made them last night to go with a smoked ham. They were so creamy and delicious! Loved the onion and garlic flavors. Used Yukon gold and sharp cheddar. My new go-to tators! Woohoo, that’s awesome, Terri, thanks so much! Wondering how it travels. I want to take to a gathering, but it is a two trip. Take it warm and then heat for a few minutes? Or cook earlier in the day and reheat in microwave? Hi Kathryn, it travels well and either way you mentioned will work great. Awesome, Desiree, thanks for the feedback! The key is to slice them very thinly, that way they’ll cook through without any need to parboil. I’ve made this recipes a few times and my family can’t get enough!!! It’s so good!! Thanks for sharing! Fantastic, Tracey, thanks so much!